The ARKSEN 2 Frame Honey Extractor comes with an uncapping knife and is a decent buy for those on a budget. Honey harvesting is ultimately the desired outcome from keeping bees, not to mention other honeybee products such as wax, propolis, royal jelly, bee bread, pollen, and mead. When it is time to reap what you worked for, the honey harvesting equipment without question must be considered. Some of these supplies include the uncapping knife, honey extractor, strainers, and honey storage jars. The honey extractor in particular is a critical equipment in beekeeping since it directly affects the outcome of the honey harvesting process. It helps retain the comb’s physical state even after the honey is removed. A honey extractor such as the ARKSEN 2 Frame Honey Extractor is a mechanical device that comes fitted with an extraction chamber that holds the honeycombs. This device spins the honeycombs and in the process removes all the honey which is directed to the bottom of the extractor for collection. The design of honey extractor is standard across all brands. They employ a centrifugal force that removes the honey without affecting the honeycomb structure. Extractors can either be radial or tangential. This classification is based on how the frames are positioned within the extractor. The extractor size also differs, some are larger and others small. The 2 frame extractor is ideal for small scale operation where those that hold up to 100 frames at once suit large scale commercial beekeepers. For more information on the honey extractor, click here. As mentioned, the honey uncapping knife is also an important honey harvesting equipment. It makes it possible for the beekeeper to make clean and quick cuts on the wax cappings that cover the honeycombs. The cappings have to be removed so as to facilitate honey harvesting since they act as an airtight seal on the cells where honey reserves are kept. Uncapping knives are available in two designs: cold and electric knives. The cold knife is placed in warm water before uncapping whereas the electric knife is warmed up by electric power. It is important to wipe the uncapping knife using a clean cloth before it is used. The knife should be clean and free from rust also otherwise these may contaminate your honey. 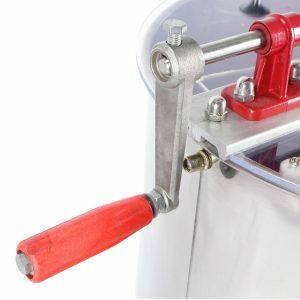 The ARKSEN 2 Frame Honey Extractor is designed to meet the needs of both the hobbyist and expert. It is an efficient and smooth unit that extracts honey from the combs without affecting the physical structure of the combs. The time-saving and labor-saving unit is made of stainless steel material which is easy to clean and also durable. It also features a honey gate valve that is easy to install and helps direct all the collected honey into the collecting jar. This is a 2 frame honey extractor with 2 solid baskets that will hold 2 frames for spinning. It can handle shallow, deep, and medium frames. It is a manually operated unit, meaning no need for electricity for one to use it. The barrel and inner frames are made of 304 food grade steel that is resistant to corrosion and rust. The holder is made of 201 steel which is difficult to rust and can even work outdoors. The bottom of the extractor has a fixed point that stabilizes the entire unit. The extractor’s handle boasts a square hole position, meaning it does not easily fall off as the case may be with traditional circular hole. The tight honey gate at the bottom of the honey extractor directs the collected honey to the jar or settling tank for it to be filtered and bottled. The components of the honey extractor can easily be separated for cleaning. It is recommended to use warm soapy water when cleaning the unit. The unit has a signature silver color. Product dimensions are 15.7 x 15.7 x 30.3 inches and weighs 27 pounds. 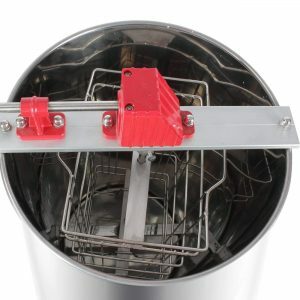 The barrel and frame are made of food grade stainless steel material that resists rust and corrosion. Does not require electric power to operate. The honey gate does not leak. Offers great stability while in operation. Easy to install the entire unit. Smooth operation and labor efficient. Can spin deep, medium, and shallow frames. Has no standing legs, so you can’t fit a bucket underneath to collect the extracted honey. You’d have to put it on a raised surface such as a table to get the honey out. Will not meet the needs of larger beekeeping operations. The ARKSEN 2 Frame Honey Extractor is a well-built unit that is best suited for a small beekeeping operation. It is made of stainless steel material that is food safe, rust and corrosion resistant. It also comes with stable base that ensures stability when in use. The easy to install honey gate in particular fits tightly making it impossible for honey to leak before the valve is opened. Cleaning and maintenance is also hassle free when you think about it. The stainless steel tank requires warm soapy water to clean and does not keep stubborn stains on walls. It is not also prone to rusting and corrosion meaning it is safe for the user. Additionally, the extractor comes with a basic cold uncapping knife. 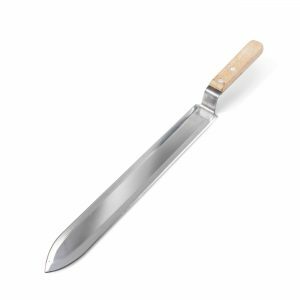 This knife is made of stainless steel with a wooden handle and manages to do a good enough job uncapping frames. If you have been considering a manually operated honey extractor for a small scale beekeeping operation then perhaps you should end your search here. The ARKSEN 2 Frame Honey Extractor will meet the needs of the hobbyists as well as professional. It can spin deep, medium, and shallow frames and holds 2 frames at once. The unit is made of stainless steel material which is not only easy to maintain but also food safe and longer lasting. Other extractor components such as frames are also made of food grade stainless steel. The unit is well designed to prevent honey leakage and even comes with an uncapping knife. This is a decent unit for those on a budget. Have you ever used the ARKSEN 2 Frame Honey Extractor? Leave a comment below and let us know what your experience was like.